October 6, 2019: Watch "Smokey Bear LIVE: Only You Can Prevent Wildfires"
Join us in fall 2019 for a Distance Learning Adventure to celebrate the 75th anniversary of the Smokey Bear wildfire prevention campaign. Watching a pretaped video, “Smokey Bear LIVE: Only You Can Prevent Wildfires,” that will be webstreamed on this web site beginning October 6, 2019, in conjunction with National Fire Prevention Week. 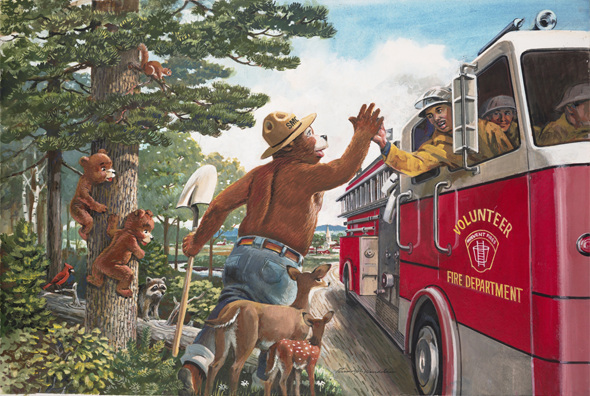 Learn about Smokey’s history as a national icon, the bear cub that was found and became the living symbol of Smokey, and Smokey Bear’s fire prevention message. 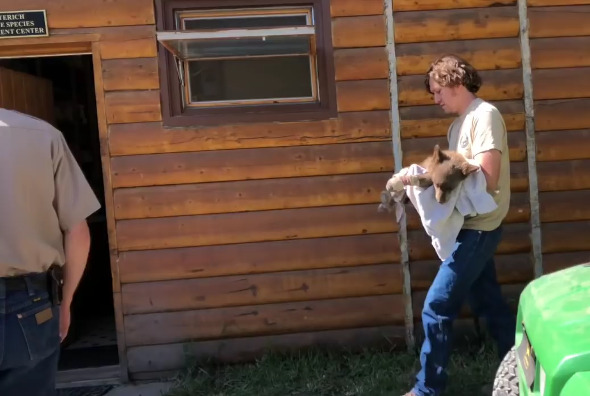 Participating in a LIVE webcast on November 7, 2019, from Capitan, New Mexico, where Smokey Bear was found as an injured cub and returned to be buried. This will be an interactive program in which students and others can send in questions about Smokey, wildfire prevention, firefighting in the past and now, how to prevent wildfires, and more. REGISTERING for updates and resources for Smokey Bear LIVE. Checking out LESSON PLANS, LINKS, and other resources about Smokey Bear and wildfire prevention. Smokey Bear is a cherished national icon who continues to remind folks to be responsible when using fire outdoors. The campaign began in 1944 as part of the war effort to protect forested land from being burned by unwanted, human-caused wildfires, so this is the 75th anniversary of the Smokey Bear icon. In 1950 an injured bear cub became the living symbol of Smokey and spent his life promoting fire prevention from the National Zoo in Washington, D.C. After 75 years, Smokey’s message is still relevant today. During this distance learning adventure, learn how natural resource managers and communication specialists have worked together to promote Smokey’s message to significantly reduce the number of wildfire and protect lives and property for millions of people. GREAT infographic from Nature Kids: The Nature Connection Pyramid.